WETHERSFIELD- Gabby Roy broke the New Britain High School record recording her 103rd hit Thursday afternoon during the Hurricanes 10-0 win over Wethersfield. Gianna Gonzalez picked up the win for New Britain allowing just three hits. Newington 9, RHAM 4: The Indians had plenty of extra base hits to help them put up nine runs. Savannah Jeln had a double. Rachel Thurston and Hannah Mullaney added triples. Mullaney and Yasmin Rincon each had a home run. With the win the Indians moved to 4-11. 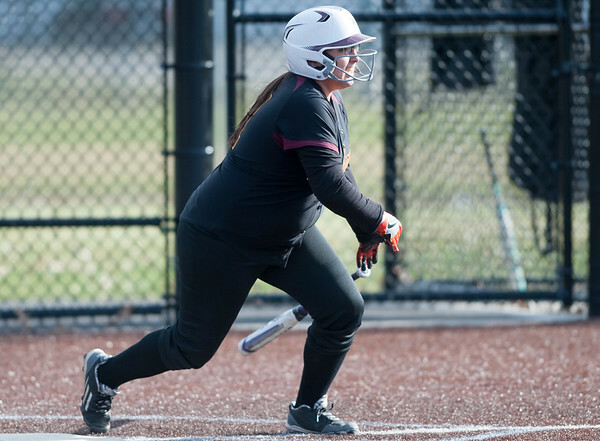 Goodwin Tech 22, Grasso 7: Bianca Olivo had three hits and three RBI. Korina Trammell had two hits and three RBI. Paola Barbosa had a three-run homer. Goodwin Tech 231, Vinal Tech 257: Despite Ryder Bonito being the medalist for Vinal Tech, the Gladiators still pulled out a victory. Jackson Collin (51), Josh Donaghy (56), Farrell Leardi (60) and Logan Stine (64) made up the scores for Goodwin Tech. Middletown 191, New Britain 227: The Hurricanes are still looking to pick up their second win of the season. There were two medalist on the afternoon Noah Blake and Shae Rozzario both from Wethersfield shot a 46. New Britain was led by Tim Carrier who shot a 51 and Johnny Morell who shot a 53. Southington 7, Manchester 0: The Blue Knights were dominant and had four of their wins result in shut outs. Abby Murphy, Coral Tommervik and Molly Murphy blanked their opponents at the No. 1-No. 3 singles spots for Southington. Joelle Stublarec and Emma Wojcicki shut out their opponents at No. 3 doubles. Newington 6, Bristol Eastern 1: The Indians picked up their fifth win of the season in dominant fashion. Outside of its loss at No. 1 doubles Newington won all the other matches on the day. Enfield 4, Newington 1: The Indians couldn’t get any offense going and only had four hits in the contest. Gunner Johnson and Jay Vereneau both had doubles for Newington. With the loss the Indians fell to 7-5. Goodwin Tech 7, Kaynor Tech 6: The Gladiators qualified for the state tournament for the 12th time in the last 13 years with the victory. Tommy Hughes struck out three in the seventh inning for Goodwin Tech. Paul Prior got the win and added a pair of doubles at the plate as the Gladiators moved to 8-5 on the season. Wethersfield 187, Berlin 203: After falling to Eagles, the Redcoats now know what they need to work on to beat their top competitor. Wethersfield is one of if not the leading contender for the CCC title, and Berlin is going after it. The Redcoats were led by Jackie Cooper who shot a 45, Alena Kittleman who shot a 52, Sydney Duke who shot a 52 and Jessica Nappi (54). Berlin is now 3-2 on the season. Rocky Hill 7, New Britain 0: Although the Hurricanes didn’t win any matches on this afternoon, there was still some success on the court. New Britain’s No. 1 doubles played exceptionally well, New Britain head coach Robert Zadrozny said. Yasser Vasquez and Jason Pinnock played three matches including a tie breaker. The Hurricanes are 1-6 on the season and they’re struggling but it’s been a rebuilding year for New Britain. Everyday they’re focusing on improvement. Posted in New Britain Herald, Berlin, Goodwin Tech, New Britain, Newington, Plainville, Southington on Thursday, 3 May 2018 21:00. Updated: Thursday, 3 May 2018 21:03.